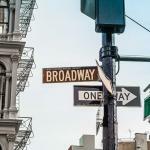 Loved by musicians, artists, and the creatives of NYC, Williamsburg has become increasingly popular and has grown in recent years. The vibe here is incredible and attracts people from across the globe. From street art, unique shopping opportunities and coffee shops to restaurants and food trucks, the area is bustling with creativity and unique individuals. Below you will find our detailed guide to the area filled with insider tips on things to do, places to eat, bars to visit and shops to explore. There are multiple trains that lead to SoHo. You can take the L to various stations, The G train from Queens or the M train. To be completely honest there aren’t many commuter options to Williamsburg, but it is definitely worth checking out. Williamsburg is another tale of a former NYC working class neighborhood turned into one of the city’s most trendy and desirable locations. Williamsburg is located on the north side of Brooklyn and just south of Greenpoint. This area has skyrocketed in to popularity with the younger crowd. The neighborhood has come a long way from its reputation of danger and widespread crime in the 1970’s. The area has drastically changed since the mid 1990’s when low rents attracted young creatives and young professionals from around the world. It is hard to imagine that this trendy, hipster, district was once unsafe and undesirable. Today when you visit Williamsburg, you will find a very special place with a great atmosphere. It’s a place that is loved by the people that reside there. Williamsburg is more than a huge contrast to the busy, noisy, and sometimes strict life in Manhattan. In Williamsburg it seems like it’s more carefree which is refreshing and you certainly notice that vibe once you step foot in the neighborhood. Walk or Bike Across the Williamsburg Bridge – The bridge starts in the Lower East Side in Manhattan and it takes you directly to Williamsburg. Walking or biking across this bridge will give you awesome views and a great experience. If you don’t have a bike, go rent one with CITI Bike. Visit Brooklyn Brewery for Some Great Beer – This brewery opened up in 1988 and is one of the most popular, if not the most popular beer in Brooklyn. 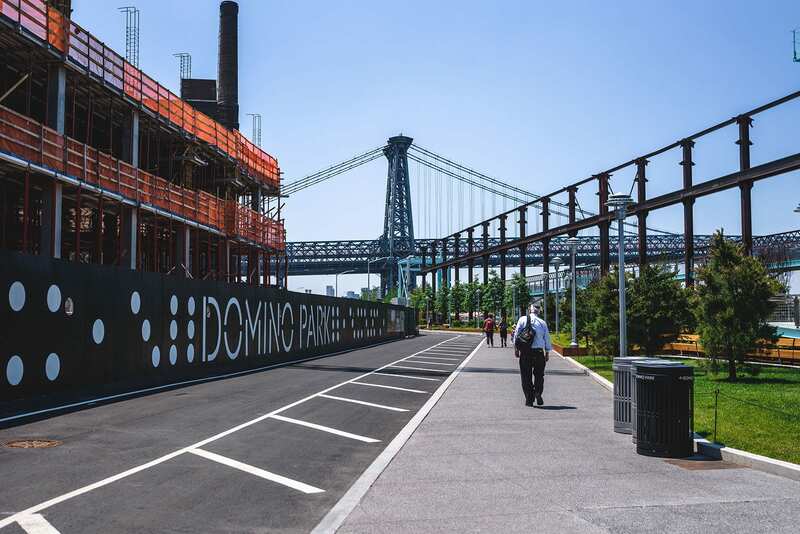 Domino Park – This park is named after the original Domino Sugar Factory because, well it was literally right there. Actually, the factory is still there, but isn’t running anymore. 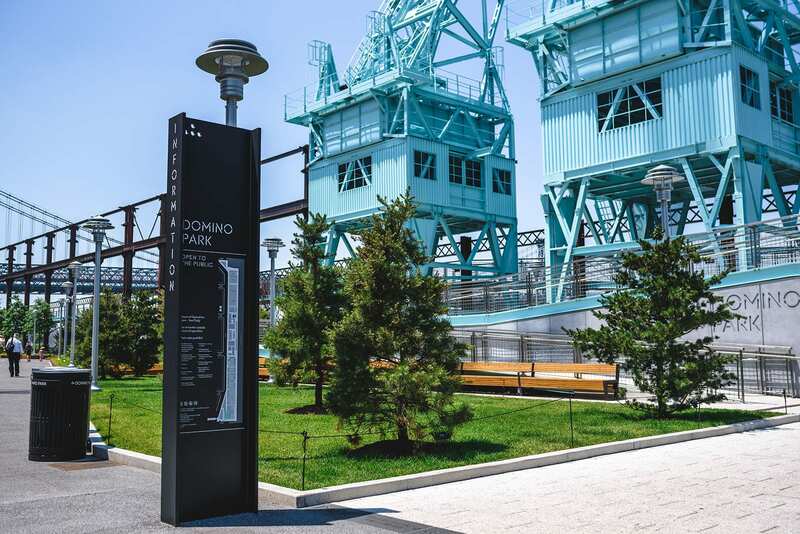 It’s NYC’s newest park and it is beautiful. 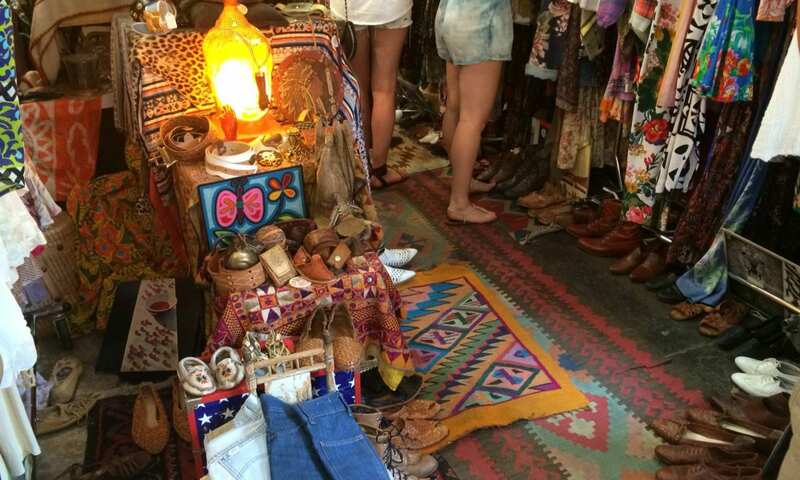 Vintage Shopping/Thrift Stores – There are thrift stores everywhere in Williamsburg. If you’re looking for vintage anything, this is the place to be. Check out L Train Vintage or other stores in the area. Go Bowling – It’s a vintage scenery so why not go bowling. Brooklyn Bowl is a great place to check out if you’re in the area. 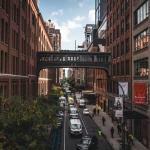 Williamsburg is continuously growing and is a place for creatives and young professionals. There are numerous things to do here. Meanwhile more than 6500 artists are living their creative life in Williamsburg. Actors, musicians, photographers and anyone with a creative background enjoy and have helped foster an environment for great restaurants, clubs, galleries and unique shops. Residents of Williamsburg live in urban lofts that used to be former factories/warehouses or rent a luxury apartment at the waterfront giving them sensational views of the Manhattan skyline. Most of the old factory buildings are full of graffiti giving the area are an artistic flair. While walking around you will see an overwhelming amount of bikes and skateboards compared to Manhattan. There’s no stress or hurry in Williamsburg. It’s a different lifestyle in this neighborhood. 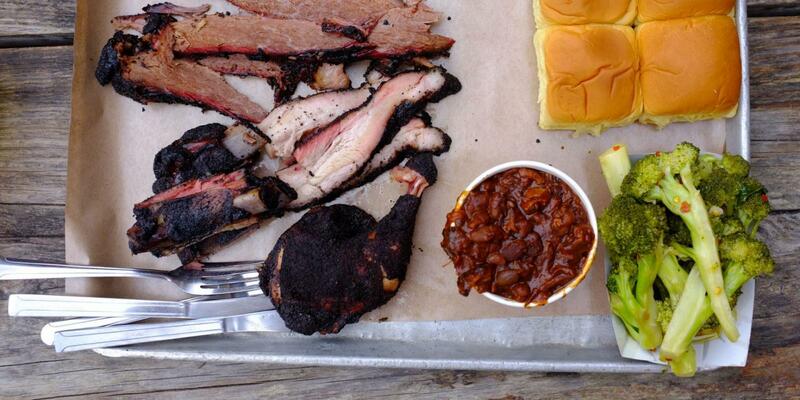 At the Smorgasburg Food Market, you can find all the unique foods Williamsburg has to offer. From pastries to Ramen Burgers, this is the place for foodies. Smorgasburg means “a mix of food” and offers a huge selection of small stalls offering the most delicious local delicacies. The most popular open food market in New York City takes place every weekend during spring and summer months, attracting New Yorkers and tourists to Williamsburg. 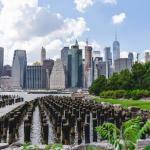 There you can eat, drink and enjoy the magnificent view of the Manhattan skyline on the East River Waterfront. The market is always open on Saturday, even when it rains from 11AM – 6PM. There are a lot of amazing restaurants so theres a bunch to choose from. Here are some articles for more in-depth details. 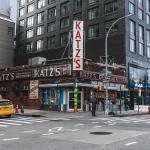 Great American kitchen with an amazing atmosphere on the famous Bedford Avenue. French food at the King & Grove Hotel! Our favorite place in Williamsburg has nothing to do with hip clubs, vegan restaurants, or thrift shops, but it has great views and a lot of places to rest. It’s NYC’s newest park as well. Williamsburg is a great destination for shopping, if you like flea markets, second hand stores or vintage items. What you won’t find here are big retailers like ZARA and H&M. Stores that sell unique products dominate this part of town. A famous example of the type of stores that thrive in Williamsburg is the second hand and exchange store Buffalo Exchange or L Train Vintage. Other shops & flea markets are ran by artists themselves and offer a variety of handcrafted products made by locals. Bedford Avenue is a great spot to find clothes or a special gift for someone. Shopping in Williamsburg is in complete contrast to Manhattan and the glamorous shops of Fifth Avenue. Art is everywhere in Brooklyn, especially in Williamsburg. All you have to do is take a walk around the area and you’ll see it everywhere. It’s embedded in the neighborhood and it’s what defines the area. 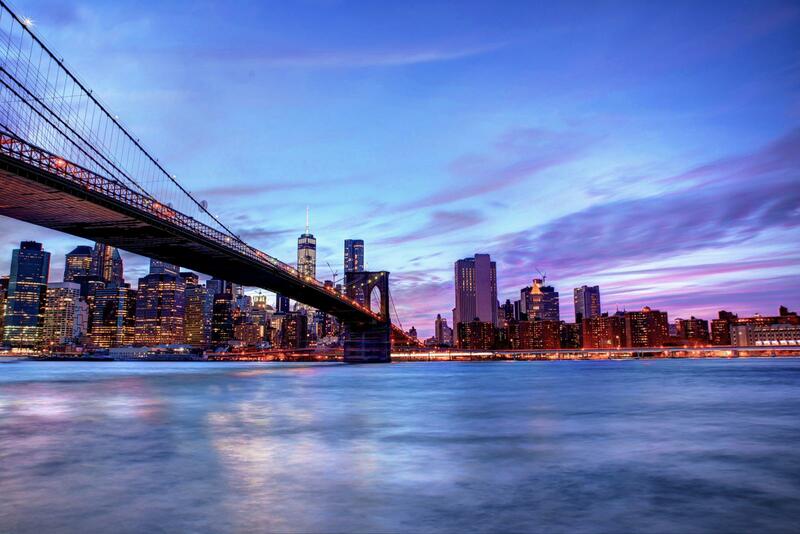 Many young people love staying in Williamsburg during their trip to New York City. Due to its reputation and relaxed atmosphere Williamsburg has become an increasingly popular spot to stay. 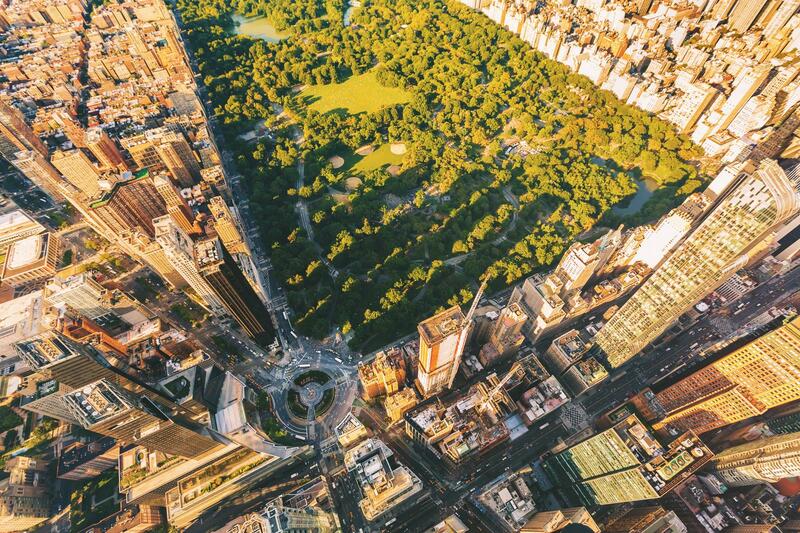 It promises a different experience than Manhattan and shows people the less commercial side of New York City. 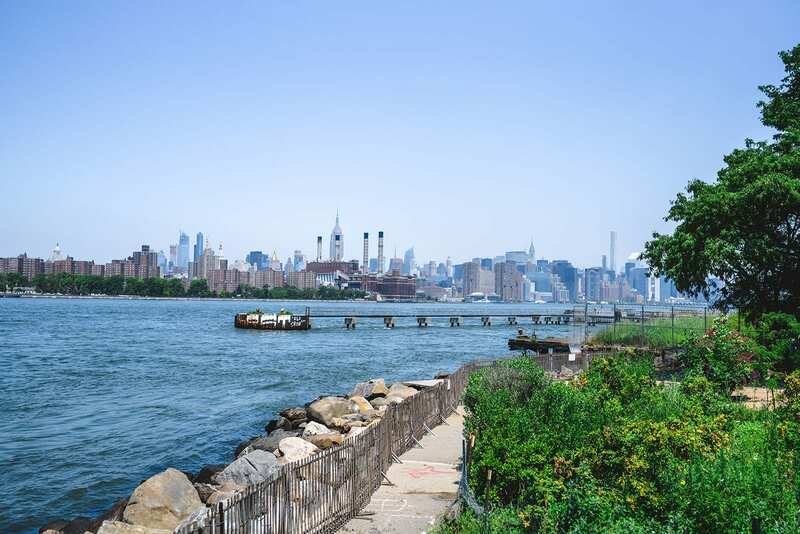 The Wythe Hotel at the Williamsburg Waterfront is a good choice for those wishing to experience the atmosphere of the district as well as get some amazing views of the city. This trendy location has 72 stylish rooms in different sizes, a fancy rooftop bar and is close to the city making it perfect as a hub for exploration. Hotel Le Jolie is a small boutique hotel and a cheaper option. Located on Meeker Avenue you’ll find cozy and comfortable rooms in the heart of the unique neighborhood. Our personal recommendation for those who want to live in an apartment, would be to try to find a place with Airbnb. This way you will get the chance to experience and live in a Williamsburg apartment and get the most value for your money. 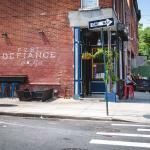 If you’re in Williamsburg, make sure to check out these nearby neighborhoods. 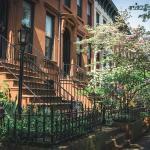 If you enjoyed Williamsburg in Brooklyn, then make sure to check out these neighborhoods below. Thanks a lot for the wonderful tour guide literature bout Williamsburg. It is absolutely amazing.